In a recent article in Counterpunch, Wes Jackson and Robert Jensen argue for the return to a ‘creaturely’ worldview based around self-organizing renewability coming out of complex and vibrant ecosystems. They believe that it will better equip us to care for the planet and survive as a species than the industrial worldview, which is non-renewable, specialized, mechanical, and requires large amounts of concentrated energy to maintain. Amy Sass’ new play Time Sensitive, now showing at Oakland’s Flight Deck Theater, echoes some similar sentiments. ‘Ordovician. Silurian. Jurassic. Cretaceous,’ chants a swaying ensemble, dressed in silver monk-like robes, during at least one interval in Time Sensitive. This and other interludes connect the characters’ individual stories with the broader narrative of humanity’s search for its place within the natural world. Suspended blocks of melting ice provide a constantly dripping backdrop, alluding to climate change while reminding us that the rest of the world operates according to different timescales than that of our modern city life. Many of the characters’ stories incorporate time as a theme, while suggesting that we can only go so far in modern society to cover up the biological and emotional realities of being human. A bank employee goes to great lengths to create perfect events for her company, even speeding up her pregnancy in hopes that it won’t interfere with work. Yet, she still ends up demoted and her subordinates replaced with robots. 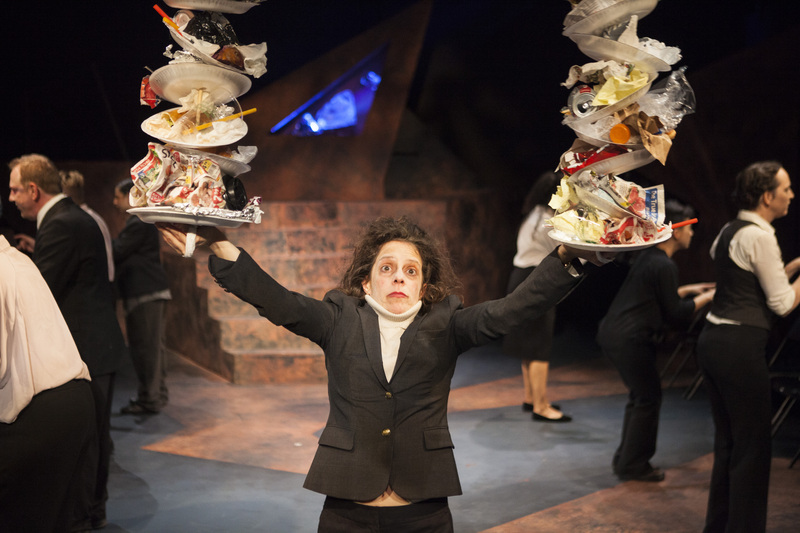 The fact that she and her fellow employees compete for roles where they literally carry plates filled with trash highlights both the environmental themes of the play and the disposability of workers in her office environment. Rachel Brown as Employee One. 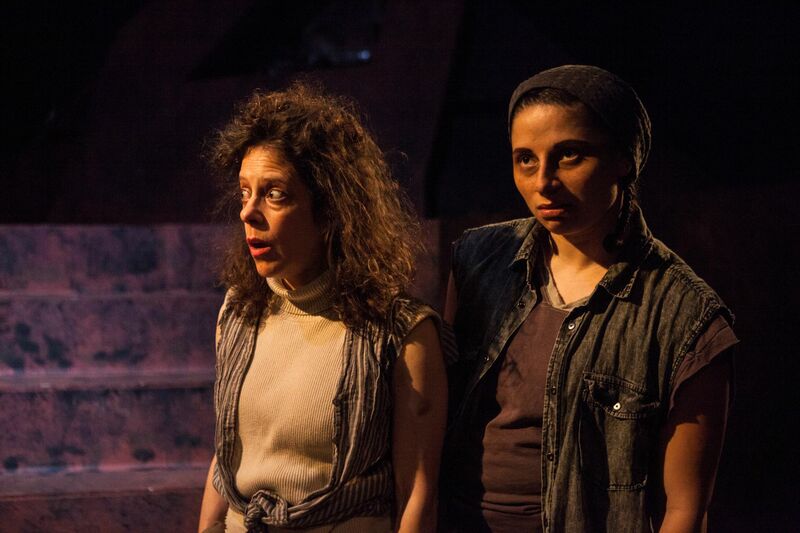 Photo by Serena Morelli for Ragged Wing Ensemble. A childless elderly craftsman builds a robotic device to maintain his clocks, and the device, called a KID, ‘grows’ up to realize that the energy it’s absorbing from the city isn’t as pure and clean as it needs. The bank CEO and building owner stares out at the view from the top of his building, ordering an engineer to build higher and higher – then realizes he’s terrified of heights. Even the impoverished pair who survive by any means necessary in the shadow of the skyscraper experience internal struggles: are they going to strive for the money, power and control everyone else in the city wants, or could it be possible to envision a different world? Time Sensitive brings a great deal of physicality to the stage, as characters carry each other, leap, dance, and move in groups to convey various moods and states of being. Telling these stories through movement that’s as prominent as the dialogue further highlights the theme of how our bodies and the natural world reassert themselves despite our efforts to impose the urban life that we consider ‘civilization.’ The dialogue also reflects this physicality, as characters speak directly, even scatologically, at times. Birth and death are two major ways that nature imposes its timescale onto our lives, as we have limited ability to reschedule either of these events. And the characters here grapple with nativity and mortality, ultimately finding, through some cleverly juxtaposed stage pairings, that both can be better faced together. This story left me with many points to ponder. Certainly the universe is much larger and more enduring than our short-term desires for career success, and we’re not going to be able to overwrite our own, or our planet’s biological makeup in a few centuries. And we do need to think about the impact of our decisions on future generations and on the Earth. I was left wondering, though, if scrambling for resources and being in a constant hurry is really that unnatural, given the short lifespan of many animals and their constant quests for food. If we’re going to go back to a more natural way of living, if we’re going to embrace our own natures and the ecosystems around us rather than completely replacing them, let’s think about how to do that without just replacing one ‘rat race’ with another. And, how far can we judge the impoverished character who sought to grab some of the wealth of the city? His character devolves into greed for much more wealth than he needs to live and he rejects his friend who doesn’t share his passion. But is there a middle ground between being so sweet/flighty that you give away your last pair of shoes to a pigeon and bring yourself harm, and mimicking the values of the most powerful people in mainstream society? How do you care for yourself and meet at least your basic needs while still living in harmony with the earth and without becoming obsessed with success and power? Some of the play’s most poignant and thoughtful moments came from the old man and the KID, who takes a Velveteen Rabbit-like journey towards becoming real. They, more so than the people at any socio-economic level within the city, had the time and space for thought and feeling, and could envision a better and more integrated and balanced life. Their journey together, their ‘birth’ and death, most brings to mind Jackson and Jensen’s concept of being ‘creaturely’ – and it is they who ultimately show the way out into a broader world beyond the confining city. 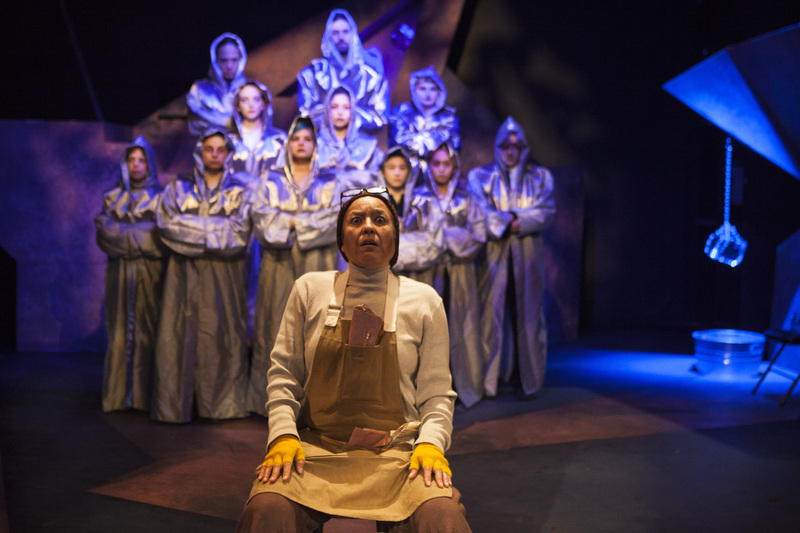 Originally created in workshop five years ago, Ragged Wing’s new production features an updated script as well as a deep collaboration with climate artist Carter Brooks and his ice-art, and environmental scenic design by Oakland School for the Arts Chair of Production Jean-François Revon. Time Sensitive runs at Oakland’s Flight Deck, 1540 Broadway.